It’s nearly November, which means that my birthday is just a few weeks away. Just like last year, I’m planning to do a weekly prize giveaway to people who either follow @glimmsworkshop on Twitter or like the Glimm’s Workshop page on Facebook. 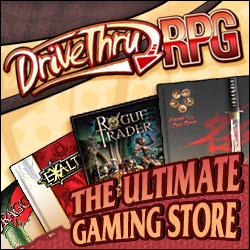 The prizes will be pdfs from DriveThruRPG for different games. A prize will be awarded to a randomly chosen follower/liker each Friday for the month of November. The first winner this year is @bryce963 who gets a pdf of Bastion of Broken Souls, my favorite high-level adventure for D&D. It was the final adventure of the D&D 3e adventure path that took characters from level 1 to 20, and sees the heroes deal with demon princes, journey the planes, and confront the legendary dragon Ashardalon. The second winner this year is @CaelanORuairc who gets a pdf of tremulus. It is a game of Lovecraftian horror that uses the same core mechanics as Apocalypse World and Dungeon World. The third winner this year is @Sitouh who gets a pdf of Numenera. It’s an rpg by Monte Cook set a billion years in the future where your characters use the leftovers of ancient high-tech civilizations as they explore the Ninth World. The fourth winner this year is Paul Thornton who gets a pdf of BattleTech Alpha Strike. It’s a fast-playing, miniatures-focused version of the classic BattleTech rules. This year’s final winner is Aleksandr Ermakov who gets pdfs of the two Fate Worlds books. They are a collection of settings for Fate Core that includes everything from playing as firefighters to mecha pilots.